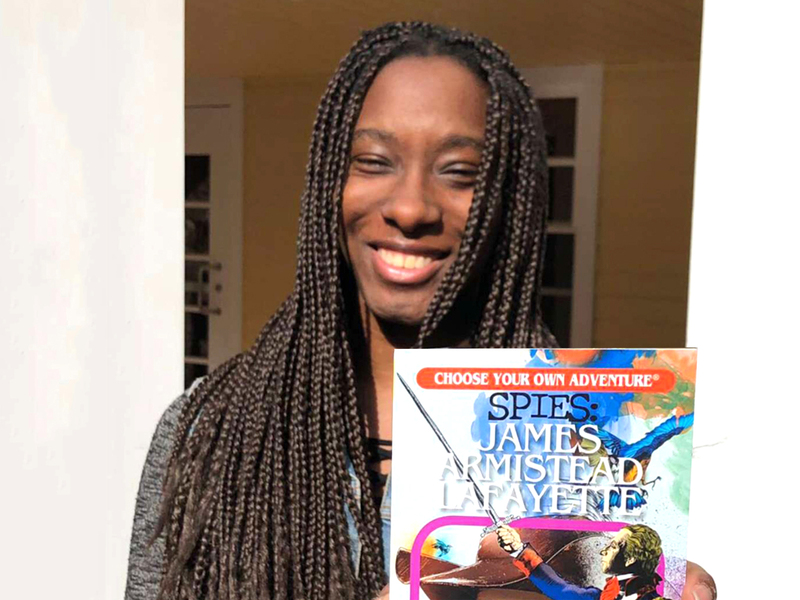 Kyandreia Jones '19 shows the cover of her new book. Creative writing major Kyandreia Jones ’19 is well versed in poetry and spoken word, but now she can add children’s author to her résumé. 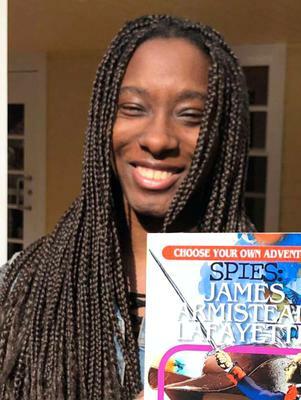 Her first book, Spies: James Armistead Lafayette, has been picked up by the Choose Your Own Adventures children’s series, published by Chooseco, and will hit the bookshelves on May 1, 2019. Jones has always been on a creative path, writing fiction since she was in fourth grade because she was tired of reading about people who did not look or sound like her. Though she often explores personal themes of mental health, family dynamics and love, Jones looked to history for inspiration for Spies. “I was constantly inspired by the wackiness of history when I started writing this story back in December 2017,” Jones said. “Did you know that there were black spies during the American Revolution? Did you know that Marquis de Lafayette detested the idea of slavery? Did you know that George Washington was over 6 feet tall and that he was an excellent dancer? I had no idea how interesting, bizarre and hilarious history was until I was asked to write this book. I still marvel at all the facts I learned. A propitious Facebook post from her Posse mentor and Associate Professor and Chair of Philosophy Katheryn Doran led Jones to this writing opportunity. After communicating with the publishers, Jones had the chance to write her first children’s book. Jones has had previous work published on campus, including Grasping Roots and Red Weather. 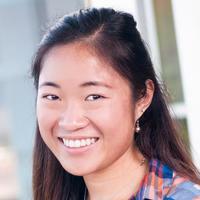 She has also performed around campus at Apple and Quill, The Funktion, Vibes night and Hamchella. Readers can find her writing in off-campus literary journals for undergraduate writers, as well. In 2017 family-owned Living Springs Publishers featured her short story, “At Home,” in their first Stories Through the Ages College Edition. 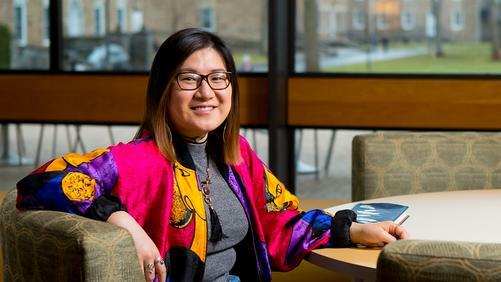 Mount Saint Vincent’s The Underground and Brandeis University’s Blacklist Journal also include her poems. In a departure from previous medium, length, style and subject matter, Jones hopes to engage with not only young readers, but with anyone who has a hankering to make change. “I hope children learn that, if given the opportunity, they have what it takes to make the world better and kinder to them,” Jones said.